TOUCH UP YOUR HAIR COLOR, TAKE THE GRAY AWAY! 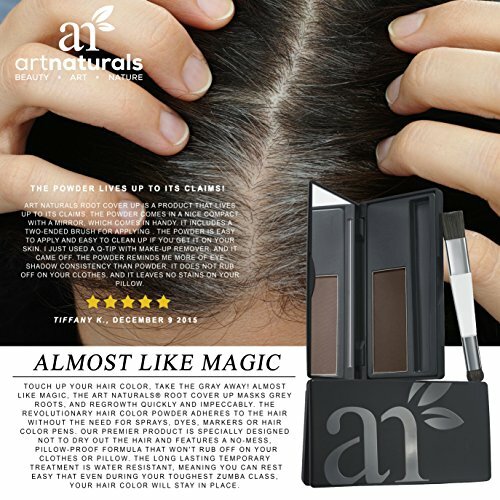 Almost like magic, the Art Naturals® Root Cover Up masks grey roots, and regrowth quickly and impeccably. The revolutionary hair color powder adheres to the hair without the need for sprays, dyes, markers or hair color pens. Our premier product is specially designed not to dry out the hair and features a no-mess, pillow-proof formula that won’t rub off on your clothes or pillow. The long lasting temporary treatment is water resistant, meaning you can rest easy that even during your toughest zumba class, your hair color will stay in place. Our Root Cover Up blends into your natural hair color, enhancing its beauty, and guarantees 100% coverage for grey or darkened roots. Safe for everyday use, the Art Naturals® Root Cover Up comes in a wide variety of shades to match any hair color. 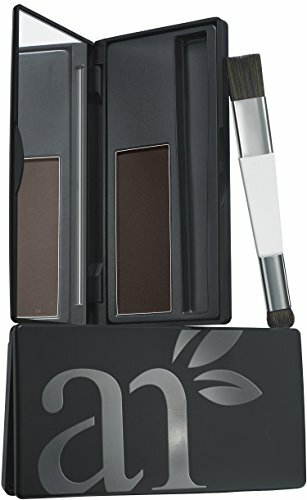 Each color consists of a multitude of color pigments to ensure a natural look when applied. Whether you are using it to conceal grey roots, or regrowth on highlighted hair, our proprietary color touch up formula is a chemical free alternative to salon products and colors. 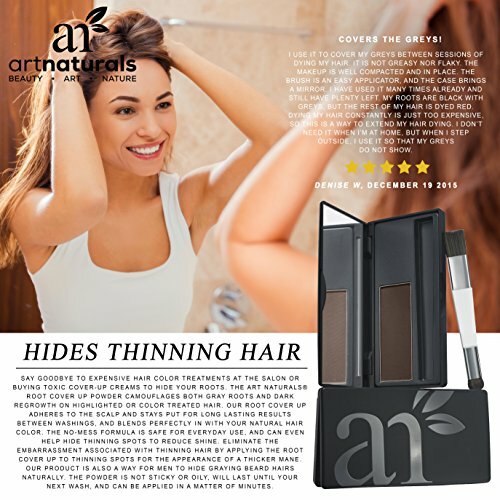 Get the natural looking root color you desire with Art Naturals® Root Cover Up, a product that is preferred by stylists, and professionally recommended. SAVE ON SALON PRICES. Why pay high end Salon prices when you can achieve 100% gray coverage at home for a fraction of the price? Say goodbye to expensive hair color treatments at the salon or buying toxic cover-up creams to hide your roots. 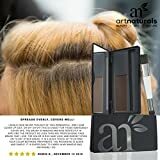 The Art Naturals® Root Cover Up powder camouflages both gray roots and dark regrowth on highlighted or color treated hair. Our root cover up adheres to the scalp and stays put for long lasting results between washings, and blends perfectly in with your natural hair color. The no-mess formula is safe for everyday use, and can even help hide thinning spots, reduce shine. 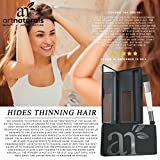 Eliminate the embarrassment associated with thinning hair by applying the Root Cover Up to thinning spots for the appearance of a thicker mane. Our product is also a way for men to hide graying beard hairs naturally. The powder is not sticky or oily, will last until your next wash, and can be applied in a matter of minutes. Simply apply to roots of dry hair using the dual-topped brush for a customized application. With small amounts of powder, begin at the scalp and work out until roots are completely covered. Repeat until roots disappear. Our product can be applied to the temples and other areas as needed. Whether you choose to forego the salon completely, or simply extend your color between appointments, Art Naturals® Root Cover Up is the solution you have been looking for! CUSTOMERS ARE RAVING. Best kept beauty secret on the market! | No time to color? No Problem! | Art Naturals® has done it again! 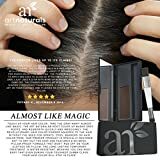 | The Art Naturals® Root Cover Up is a breakthrough mineral powder designed to cover gray hair, thinning spots, and hair regrowth on highlighted or color treated hair. Our easy to use product provides the best coverage in one fast application, and the water-resistant powder will last through rain, and sweat until the next time you shampoo your hair. The no-mess formula masks roots without flaking off on your clothes or pillow, providing a long-lasting temporary solution for hair color. Unlike hair color mascaras and sprays that leave your hair feeling greasy, the powder root touch up works like a pro to disguise grays without leaving a greasy residue behind. Art Naturals® uses all natural ingredients to ensure the best results without the fear of damaging or drying out your hair. Eliminate the need to wear a hat on bad hair days, by spending a few minutes applying our Root Cover Up. Your hair will thank you! 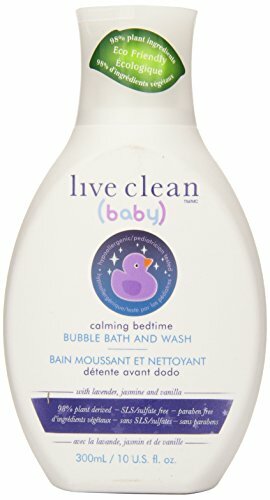 This product is a life changer! | Where has this been all my life?? | From skeptic to believer in under five minutes! 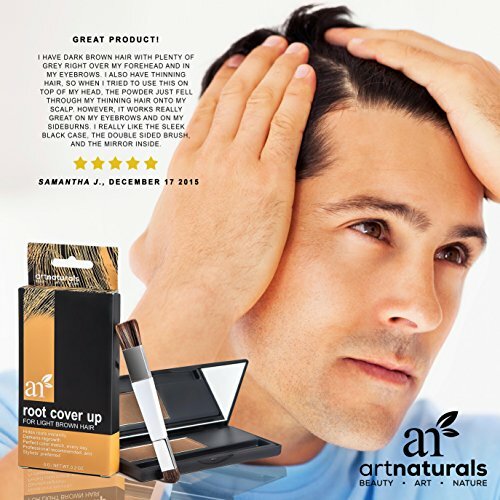 Art Naturals® Root Cover Up masks gray roots or regrowth on color treated hair, seamlessly, in a matter of minutes. Our premier formula is specifically designed to provide the best coverage without drying out or causing damage to your hair. The long lasting temporary treatment is water resistant, meaning you’ll rest easy that even during your toughest zumba class, your hair color will stay in place without flaking on your clothes or running down your face. The powder consists of a multitude of color pigments to ensure it’s going to blend naturally in with your hair. 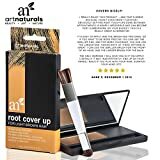 Whether you are seeking to say goodbye to the salon endlessly, or just a quick touch up to extend your color between treatments, Art Naturals® Root Cover Up is the best solution for complete coverage. Our proprietary formula is preferred by stylists and comes professionally recommended for everyday use by men or women. When applied to thinning hair, the cover up powder also helps hair look fuller with minimum effort. Customers rave that this is the best kept secret in the haircare industry! 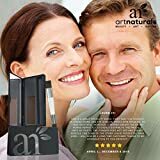 Art Naturals® is committed to providing only the highest quality beauty products made with organic materials to provide the most comprehensive benefits for you. We are committed to seeking out the healthiest and most natural ways of combating internal and external forces that negatively have an effect on your overall well being. On account of this commitment, our Root Cover Up Powder is prepared with the greatest care to preserve its natural elements, meaning you’ll see noticeable results immediately after using it. Our products are also backed by a 100% money back satisfaction guarantee which makes trying them risk free! Order your Root Cover Up, and experience the Art Naturals® difference today! TOUCH UP YOUR HAIR COLOR, TAKE THE GRAY AWAY! Almost like magic, the Art Naturals® Root Cover Up masks grey roots, and regrowth quickly and impeccably. The revolutionary hair color powder adheres to the hair without the need for sprays, dyes, markers or hair color pens. Our premier product is specially designed not to dry out the hair and features a no-mess, pillow-proof formula that won’t rub off on your clothes or pillow. The long lasting temporary treatment is water resistant, meaning you’ll rest easy that even during your toughest zumba class, your hair color will stay in place. Our Root Cover Up blends into your natural hair color, enhancing its beauty, and guarantees 100% coverage for grey or darkened roots. 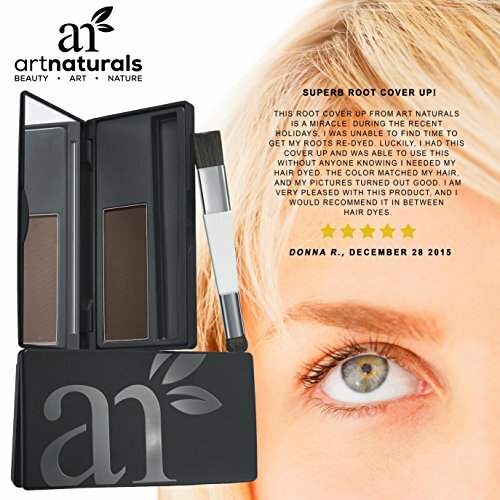 Safe for everyday use, the Art Naturals® Root Cover Up comes in a wide variety of shades to match any hair color. Each color consists of a multitude of color pigments to ensure a natural look when applied. Whether you are using it to conceal grey roots, or regrowth on highlighted hair, our proprietary color touch up formula is a chemical free alternative to salon products and colors. 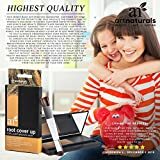 Get the natural looking root color you desire with Art Naturals® Root Cover Up, a product that is preferred by stylists, and professionally recommended. SAVE ON SALON PRICES. Why pay high end Salon prices when you’ll achieve 100% gray coverage at home for a fraction of the price? Say goodbye to expensive hair color treatments at the salon or buying toxic cover-up creams to hide your roots. The Art Naturals® Root Cover Up powder camouflages both gray roots and dark regrowth on highlighted or color treated hair. Our root cover up adheres to the scalp and stays put for long lasting results between washings, and blends perfectly in with your natural hair color. The no-mess formula is safe for everyday use, and can even help hide thinning spots, reduce shine. Eliminate the embarrassment associated with thinning hair by applying the Root Cover Up to thinning spots for the appearance of a thicker mane. Our product is also a way for men to hide graying beard hairs naturally. The powder is not sticky or oily, will last until your next wash, and can be applied in a matter of minutes. Simply apply to roots of dry hair using the dual-topped brush for a customized application. With small amounts of powder, begin at the scalp and work out until roots are completely covered. Repeat until roots disappear. Our product can be applied to the temples and other areas as needed. Whether you choose to forego the salon completely, or simply extend your color between appointments, Art Naturals® Root Cover Up is the solution you have been looking for! GENTLE INGREDIENTS EVERY TIME. At Art Naturals®, healthy and organic products are our specialty. By choosing Art Naturals® 100% pure and organic products, you are choosing freedom from toxic chemicals that wreak havoc on your body. Products made with organic ingredients are not only safer for the body, but they also contain more vitamins, minerals and nutrients than conventional products. Art Naturals® is committed to continually researching and experimenting as we seek for the healthiest and most natural solutions to combat internal and external factors that negatively have an effect on your face, skin, hair, nails, eyes, and overall well being. Our products are prepared and delivered with the greatest care to preserve and maximize their beneficial elements. Our Root Cover Up and other hair products deliver results that are immediately noticeable and enhance the natural beauty of your hair. Our top of the range ingredients won’t aggravate your scalp, and you’ll NEVER find harsh chemicals in any of our Art Naturals® lines. As an added benefit, our packaging keeps the environment in mind and is made from recycled materials. Our products are never tested on animals, and are certified vegan. Give your hair the natural look and feel provided by our Root Cover Up, and experience the Art Naturals® difference today! 100% MONEY BACK SATISFACTION GUARANTEE. Customer satisfaction is our top priority! We only produce the highest quality products designed to exceed customer expectations. All of our health and beauty products are backed by a 100% money back guarantee meaning that if you don’t LOVE your results, you’ll return your product for a full refund, NO QUESTIONS asked. The Art Naturals® Root Cover Up is just what you want to help eliminate embarrassment over roots, patches of thinning hair, or shiny spots. The concealer applies quickly to camouflage roots whilst absorbing oils, and will withstand even your hardest workouts. This revolutionary breakthrough mineral powder is the best cover up solution to mask gray or regrowth at your roots. Extend your hair color between trips to the salon with use of our Root Cover Up. Your friends will be asking how you keep your hair so healthy without having it dyed! 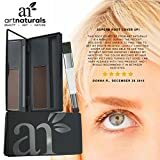 As a leading brand in the health and beauty industry, Art Naturals® allows you to take a look at our products RISK FREE. 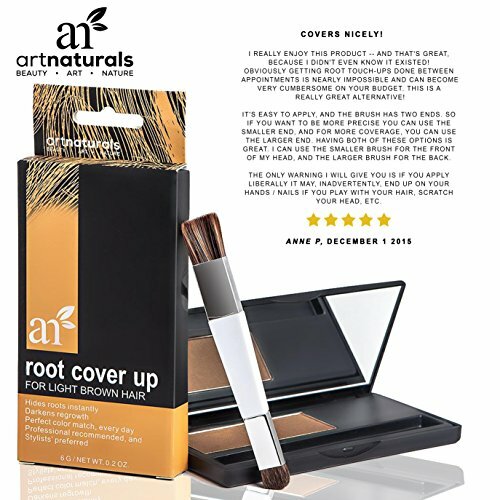 Order your Art Naturals® Root Cover Up today, and experience seamless root touch up from the comfort of your own home!